Gundica Clean Up - June 30, 2018 ~ The Toronto Hare Krishna Temple! Please join us on Saturday, June 30th for a very special clean up! As you may already know, on July 14th we will be holding our 46th annual Festival of India (Ratha Yatra) and every year we clean the temple two weeks in advance. 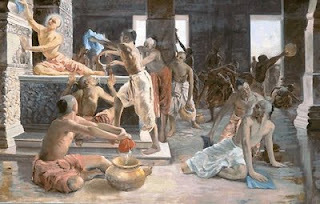 This is following the example set by Sri Caitanya Mahaprabhu, who held the first Gundica Clean Up some 500 years ago. This year we will be cleaning the temple on Snana Yatra, which is the day their Lordships Sri Jagannatha, Sri Baladeva and Sri Subhadra are bathed. After this bathing ceremony, all three fall ill and go into seclusion in order to get better. After two weeks, They will re-emerge for Ratha-Yatra. It is important that the temple is clean for when Lord Jagannatha makes His appearance after recuperating from being ill for two weeks. So please join us for this amazing service. We promise it's going to be a fun day!